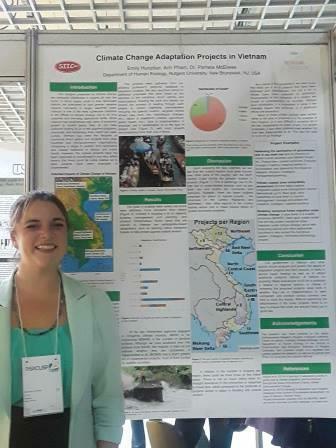 During her final semester at RU, EPIB student Emily Hunziker was invited to present her research on Climate Change Adaptation Projects in Vietnam at the University of Sao Paulo's International Science and Technology Symposium last week. SEBS has held a partnership with USP for over twenty years, and they will send winners of their symposium to Rutgers in April to participate in the GH Cook presentations. Emily's work was conducted last year for Aresty's Undergraduate Research Program, with partner Anh Pham and advisor Dr. Pamela McElwee, who specializes in the climatic impacts of Vietnam and the region. Pictured Emily Hunziker standing next to her poster.